David Douty Colton - They named a town for him! Most average Coltons have not been large physical specimens, but David Douty Colton was put together very well, even by today's standards, standing over 6 feet tall with a muscular physique and a head of fiery red hair that went well with his bold and expressive temperament. Born 17 July, 1831 in Monson, Maine to Isaac Watts and Abigail (Douty) Colton (#940). He was the first and only son of this marriage, followed by sisters Angela and Martha Colton. His father was a Farmer in the area of north central Maine. In 1836 this family, like so many others of that time, emigrated from Maine to Illinois and settled in Galesburg, Knox Co., IL, not far from Monmouth, IL, the birth place of Wyatt Earp, who later would become the most famous early resident in the town of Colton, CA. Galesburg, IL was named after the Rev. George Washington Gale, a Presbyterian clergyman, who founded the town in 1836 as a site for a Manual labor/Liberal Arts College created from profits of funds derived by selling townsites to settlers at $5.00 per acre. First known as Prairie College and under the name of Knox Manual Labor College it would become David Colton's alma mater. This is a college still in existence, but now known as just Knox College, whose records show more than 25 Coltons having attended there during its long history. Carl Sandburg, the poet, was a native of Galesburg and recalled during his early boyhood the saloons in town had signs in front announcing Sample Rooms where traveling salesmen could display their goods, and customers could sample whiskey and beer while they inspected the merchandise. This in a town known for its narrow Calvinistic moral code, characterized as godly fascism! When stagecoaches would approach Galesburg the driver usually stopped at the outskirts and warned passengers, you had better put away them cards, and hide your flasks and keep from swearing if you kin, were coming into Galesburg, a pious, teetotaler, abolitionist town! The Coltons were not like some of the early settlers and that early moral code left its imprint on David Coltons mind as he remained temperate in his habits throughout his life. Sometime during his freshman year, Colton proposed marriage to a Miss Ellen Mason White, a student in the women's seminary on the campus of Knox Manual Labor College. She was the daughter of Dr. Chauncey and Maria S. (Brownson) White, who had moved his family to Galesburg from Chicago, Illinois. Ellen White turned down David's proposal because, as he later like to relate, her father considered him to be a young man without prospects! A classmate, Hiram G. Ferris, a 28-year-old Junior at Knox, became close friends with David Douty Colton, a friendship that would change the entire course of Coltons life in the years to come. These two classmates were drawn by the lure of California gold. Together they dropped out of school and left Galesburg in the Spring of 1850 in a light wagon with three horses that Colton had purchased with a loan of a few hundred dollars from his father. The pair traveled to Council Bluffs, Iowa, then a Mormon settlement known as Kanesville, near the Missouri River. Kanesville was a popular outfitting point for immigrants traveling westward by wagon train. Wanting to get to the gold fields as quickly as possible, and wanting to avoid the risk of Cholera, a common and fatal disease among wagon trains, they decided to take their chances and crossed the remaining 1500 miles on their own to California. Leaving Kanesville on April 25, 1850, Colton and Ferris arrived at Placerville, nicknamed Hangtown, in El Dorado County, California July 9th, a journey of only seventy-six days. The following day they sold two of the horses for $190 and used the money to outfit themselves with mining gear. Their first exposure to mining camps quickly dashed any hopes they had for getting rich quick. In a letter to his family, Ferris wrote that of the thousands who were there, not many were a cent richer than when they came a year ago. Later, in another letter, he wrote that there was no doubt gold is abundant but the difficulties of getting possession of it honestly and fairly is the rub; it requires uncommon industry and perseverance to succeed. Man should have the perseverance of an Ant and the constitution of a Mule! Their claim produced enough gold for Colton to repay his fathers loan but he had also came down with typhoid fever, an illness that lasted six weeks and left him too weak to carry on with the arduous work of mining. From the mines he went to San Francisco and from there took passage to Portland in the Oregon Territory. From there Colton joined a group of miners in an expedition into northern California that arrived at Yreka Flats in present day Siskiyou County, California. Yreka Flats had its County seat in Shasta City, CA. Travel between these points was made difficult by a range of mountains separating the two areas. In the absence of formal law enforcement, miners adopted their own methods of justice and whippings and lynchings were common practices. A number of concerned miners initiated a movement to incorporate the area as a county and an incident in the spring of 1851 added momentum to that movement and ultimately led to the election of David Colton as County Sheriff. He was a man of dashing courage and several of his experiences as Sheriff are of romantic interest! One incident began when a group of Klamath Indians, under the leadership of Chief Chinook, killed two miners. In a version Colton later told a newspaper reporter, he and a companion, not yet knowing of the murders, entered Klamath village and noticed Chief Chinook was wearing clothing and carrying firearms belonging to the miners. Colton and his companion then realized the miners must have been killed by the Indians, but kept their silence and returned to camp. They informed the rest of the camp and a group of miners, including Colton, went in search of Chief Chinook and his band of Indians. They were found and a gun battle ensued. Several Indians were killed, but Chief Chinook escaped. Colton led two volunteers in pursuit and after a lengthy search the Chief was captured. While returning the Chief to the miners' Camp they came across a group of squawmen - white men cohabitating with Indian women. One of the men was a dangerous character by the name of Vail, who would later serve a term in prison. The squawmen threatened to free Chief Chinook, but under the cover of darkness, later that night, Colton and companions were able to sneak away with their captive. When they finally reached their Camp, Chief Chinook was tried by a miners' court for the murders, found guilty and sentenced to be hanged. The hanging turned out to be a very clumsy affair. A butchers gallows was used for the hanging, but none of the miners were willing to place the noose around the Chief's neck. Another Indian volunteered to do so, but he was considerably shorter than the Chief so in order to place the noose properly he had to climb on the Chief's back. The Chief resisted by taking hold of the noose with his teeth. At this point, one of the miners, bracing his knee against the Chief's chest, pulled the noose from his teeth, breaking some of the Chief's teeth in the process. When finally the plank on which the Chief was standing was removed, his foot caught on a rope supporting the plank. After much difficulty, the rope was cut and the execution was completed! Siskiyou County was incorporated in 1852. By now, Ferris had rejoined his friend Colton and the miners at Yreka Flats where they would play important rolls in the new government. The first County elections were held in May 1852. Ferris was elected County Clerk and Colton , who had distinguished himself in the capture of Chief Chinook, was the choice of Sheriff but he was only twenty, too young to hold office. Charles McDermott was elected Sheriff and Colton was made undersheriff. McDermott had little interest in being Sheriff so David Colton performed most of the duties. At the next general election, Sept. 7, 1853, Colton, now old enough, was elected Sheriff over two other candidates, receiving 827 out of 1,457 votes cast. By December of 1853 David Colton returned to Galesburg, IL, at taxpayers' expense, presumably to apprehend a fugitive and return him to California. While in Galesburg, he tried again for the hand of Miss White and this time succeeded in marrying Ellen White. Their wedding was performed by none other than the Rev. George Washington Gale at the local church, March 1, 1854. They returned to California by way of Panama in April, 1854, but without any fugitive. It came to light the fugitive had been in Sacramento, CA all the time. Nevertheless, Colton billed the state for $1,723 for expenses that were paid by an act of the state legislature! David Colton fathered two daughters, Helen in 1854, and Carrie eighteen months later in 1856. Helen would marry Crittenden Thornton, an attorney, who later became a Justice on the state Supreme Court. Carrie married Daniel Cook, a prosperous mining engineer but died childless a few years after the marriage. Cook never remarried. In 1855, Colton and Ferris, in partnership with three other men, purchased the first newspaper in Yreka, CA., renaming it the Yreka Union. Initially it was agreed the paper would be politically independent but Colton and Ferris, being ardent democrats, soon gave it a pro-democrat tone. David Colton, in his later years, was often referred to as General D. D. Colton, a title he acquired when he was commissioned a Brigadier General in the Siskiyou Co. branch of the California State Militia. It was organized in 1855 and the Brigade was made up of a Company of 75 men and staff officers. The most significant duty as a brigade occurred during the Modoc War of 1856 when several more miners were killed by Indians. The Militia was activated and initiated a campaign of pacification. The total force amounted to about 200 men and included Coltons 2nd Brigade. The war consisted of a series of skirmishes. The men provided their own horses, food and weapons. Three Troopers were killed, several Modoc Indians were wounded, one Modoc village was destroyed and a woman was killed. Peace was restored and Chief Schonchin agreed to restrain his people. At the expiration of his term as Sheriff in 1857, Colton entered the race for the state Senate as the Democratic candidate. Coltons devious marriage trip, perhaps, lost him the election. He was involved as a principal in three near duels. By comparison, his friend Ferris was never involved in even one. The first duel stemmed from rivalry between local Democrats and Whigs. Angry words were exchanged between Colton and a southern Whig who accused Colton of being from too far north to accept an insult as a gentleman. Colton grabbed the man by the nose and snarled, try me and see. This resulted in a challenge to a duel but Hiram Ferris intervened at the last minute and the duel was called off. The second near duel had Colton as the challenger with his opponent for the state Senate in 1857. Whether the duel was ever fought or not is not known. The last duel occurred in early 1858 between the local Coroner over an article Colton had printed in the Yreka Union. Because dueling was illegal in California arrangements were made for the two men to face off at forty paces with Mississippi yager rifles and would take place in Oregon, just north of the border. On the afternoon of Feb 9, 1858 their seconds and a host of spectators gathered but before shots were fired, friends of the combatants urged a reconciliation. His opponent withdrew and their respective supporters still argue over who it was made the first peace offer. Mrs. Colton considered her husbands dueling to be sinful, and in a letter back to Galesburg and her former church, she asked them to pray for his forgiveness. In November, 1856, Hiram Ferris returned to Illinois. His years in California had been fairly profitable and he left behind a ranch and various notes and other business matters. He took with him one gold bar valued at $1,895.39 and bank deposits totaling $6,018.00. Back in Illinois he married the daughter of one of his former teachers and became prominent in local business and public affairs. Colton served as trustee to Ferris business interests for the next several years. Having lost his bid for state Senate, Colton gave his ambition a new direction. In early 1858 he and his family went to Albany, the capital of New York, where he studied law. There is no evidence he attended any school and he may have done his studies by reading law in the office of an already practicing attorney, a common form of legal education at the time. He made the acquaintance of Ralph C. Harrison, also a law student. Harrison had served in the Connecticut state legislature and had been a teacher of math and ancient languages in New York. After completing his legal studies, Colton, his family and Ralph Harrison, moved to San Francisco. Colton brought a law library he had purchased in Albany and was authorized to practice law in California by the state Supreme Court on October 3, 1859. Shortly thereafter, he and Harrison entered into a joint law practice in San Francisco. Harrison handled most of the legal work while Colton devoted his energies to politics and business dealings. Why sit around waiting for a $50 fee when a smart trader can go out and make $500 in half the time? he was quoted as saying. Through many trades David Colton ultimately became a wealthy man and being much involved in politics of the day he saw the strength of the Democratic party in California lose much of its power and backing. In the gubernatorial campaign of 1863, the party split into two wings, the Colton Party, so called because of a movement to endorse David Colton for governor or as a US Senator, and the Buchanan/Breckenridge faction. Slavery was a big issue, but when Colton called for a state convention only a dozen supporters showed up when 305 had been expected. Recognizing that the Democratic Party had dwindled away to next to nothing in the political atmosphere of slavery and the Civil War, David Colton withdrew from active involvement in state politics, but remained a Democrat until he died. In 1865, at the end of the Civil War, the Colton family left San Francisco for a two year vacation, traveling through England, Europe, Turkey, Egypt and the Holy Land. While Colton had experienced political disappointment during the Civil War years, his mining and real estate investments proved to be highly profitable. 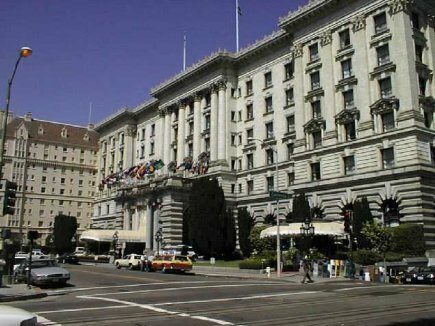 He was President and major owner of the Amador gold mine, which yielded half-million dollars annually and his San Francisco properties brought in rents totaling $3,000 monthly. 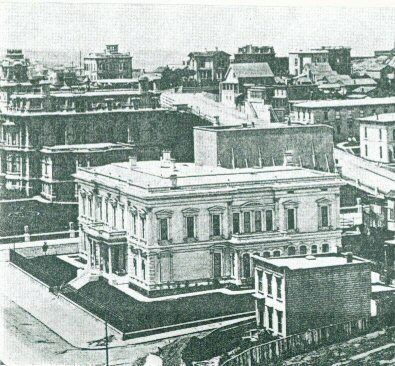 In 1872 Colton built a stately mansion on San Francisco's Nob Hill. Located on the NW corner of California and Taylor Streets it became known as Colton House built on a half city block at a cost of $75,000. It was constructed of wood and painted white, patterned after a white marble palace in Italy. The interior was decorated with works of art and antique furniture acquired during their two year travels and contained a large library stocked with works of English literature. The house became something of a showplace and several architects and artists considered it to be one of the most artistic dwellings in San Francisco. Some even compared it to the White House in Washington DC. In 1874 Colton joined a group of Nob Hill residents securing a franchise from the city to construct and operate a cable car up California St. to the top of Nob Hill. Construction costs were estimated at $500,000. The project was completed in April, 1878 and the cable car proved to be one of the most successful ventures in the city! For the record, the widow Colton would sell the house in 1902 and it would be destroyed by the fire that swept through that section of the city during the great earthquake in April of 1906. Tents to shelter the homeless were pitched on the empty lot and subsequently the lot was donated to the city to be used as a childrens park. David Colton rose to his greatest prominence in 1874 when he became associated with the directors and principal stockholders of the Central Pacific R.R. that built the western most section of the nations first transcontinental railroad. During the next few years he worked on a variety of railroad projects in California. Through his association with Charles Crocker, who had built a house on Nob Hill across the street from David Colton, he accompanied him on a trip to the Rocky Mountain Coal & Iron Co. Crockers intent was to get Colton to invest in the yet undeveloped company. Colton recognized the potential with trains needing coal for fuel, and he told Crocker he would invest in its development. Crocker offered him the Presidency and General Managership if he bought 1,000 shares of stock. Colton accepted and became Presidenta and General Manager in January, 1871. Over the next few years Colton developed the Company into an efficient and profitable source of coal for the railroads. The panic of 1873, and the depression that followed, hit California and the West especially hard, and an association was formed that included Colton. He signed a promissory note for $1,000,000 payable in gold coin. In exchange, he was made a co-director of the most powerful corporation in the American West and gained the opportunity to share in the financial profits. On August 30, 1875, he was elected a director of Central Pacific R.R. and the following day he was appointed the company's Financial Director. Of course David had his detractors. At the time, he was refereed to as having a way of struting through the building like a bantam rooster, looking neither left nor right. Another said of him that the inflation of his fortunes has brought with it inflation of his vanity, until today there dwells no man so able or so important as is General D.D. Colton - in his own estimation. And even many years later, and long after his death, he was still characterized as having been a shrewd opportunist who ingratiated his way in business. Though he amassed a large fortune, he still served as the President of the board of Trustees of the California Academy of Sciences and was a liberal contributor to its support and extention. How Colton, California came to bear our surname stems from David Coltons role as V. P. of the Southern Pacific R.R. In October, 1874 Colton and Crocker attended a meeting in San Bernardino. Residents there wanted the railroad to pass through the city but a line through that city would have been off the most direct route and prohibitively expensive to maintain. A stretch of land southwest of San Bernardino was the most likely site for the location of an S.P. train station and so it was the town of Colton came to be. The townsite is said to have been named Colton by officials of the railroad in honor of David Douty Colton but some suggested that Colton himself named the town. Regardless, they now had a town named after a man who had never lived there! On August 1, 1875, a Southern Pacific train, the first to enter the San Bernardino basin, arrived at the new station house at the foot of present day 9th Street in the City of Colton, California, and as a town, they were in business. It was in August, 1878, that David Colton sustained an injury while riding a young, unruly horse at his Mount Diablo Ranch, it fell on him. At first, the injury was thought to be minor and his wife and daughter Carrie left for a planned trip to New York. The injury, however, involved ruptured blood vessels which eventually produced abscesses. Doctors opened three of the abscesses hoping they would heal, but the operation resulted in blood poisoning. During the next few hours his condition deteriorated. Mrs. Colton and Carrie were advised by telegram to return to San Francisco as quickly as possible. Ralph Harrison, Colton's former law partner, was summoned to draft a will. Later that night Colton seemed to rally but by morning it was apparent to his doctors that recovery was hopeless. Several of his closest friends kept vigil around his deathbed in the second floor bedroom of Colton House. About noon he lapsed into unconsciousness. By late evening, his vital signs were so weak the doctors had difficulty determining if he still lived. On Wednesday, October 9, 1878 he was pronounced dead. Embalming began immediately, hoping to preserve the remains until Mrs. Colton and Carrie could return. They had left New York on a Tuesday and in Mendota, IL (my mothers hometown) they were joined by Mrs. Colton's brother, and the party boarded a special train provided by the Chicago, Burlington & Quincy Railroad. They continued by special trains to Ogden, UT, where they boarded another special train that carried them to San Francisco. They arrived on Monday, October 14th. The funeral was held the following day in the Episcopal Church. David Colton was buried at Mountain View Cemetery in Oakland, CA. 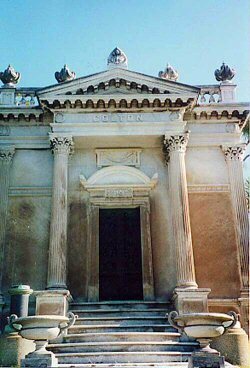 A mausoleum was built to house the tomb and was clearly visible from Colton House on Nob Hill. The mausoleum still stands, funds for its maintenance come from a perpetual endowment. The entire estate of David Douty Colton was left to his widow. Mrs. Colton was an intelligent and clear-thinking woman and had considerable understanding of her husband's complex business dealings, but even she was ill-prepared for the struggle that was to follow. A lawsuit for fraud was filed, a civil suit would follow and then countersuits. Old friends would desert and some even turned upon her. Some trials resulted in legal victories but at the cost of public respect. It would take 12 years for these legal battles to end, and she had spent over $100,000 in legal fees only to see $4,000,000 of the estate lost just in trying to clear her deceased husband's name. She would be left with an annual income of about $28,000. She would later die in New York City. Perhaps the time has come to reappraise the life of David Douty Colton. Think of him as you will, it must be recognized that it took much more than just ingratiation to gain the confidence of other men and business associates, and that credits him as having been a respected business man and financial manager whose talent provided much needed support during some of the trying times in their complex enterprises. So it is that we close another chapter on a Colton ancestor, who threw himself into life full force, lived his life to the fullest and left behind a heritage of achievement and success for all to not only envy and marvel at, but to take pride in as well! Editors Note: There are many books and writings that cover the life of David Colton, the development of the West, the town of Colton, California, and much more. Most of the facts in the preceding story, however, came from the book, David Colton, Namesake of Colton, California as written by Larry Sheffield, who currently resides in Colton, California. Mr. Sheffield, a local historian, is vice president of the Colton Area Museum Association and a freelance writer. Without his kind help and permission, I could never have provided you this interesting bit of history! Addendum: There has been much speculation as to how the town of Colton, California was named. 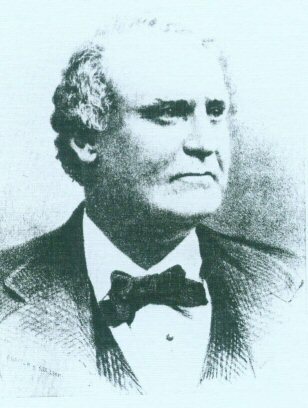 It has been written in the preceding story that Colton was named for Colton, David Douty that is, the vice president of the Southern Pacific Railroad. Not according to Mrs. Minnie (Colton) Pierson! In Nov, 1941, James G. Dooley, managing editor of the Burbank daily Review, wrote a letter to Kyle Alexander, business manager of the Colton Daily Courier, informing him that Colton, California was, in fact, named after Edwin Colton and not David Douty Colton. Edwin Colton had passed through Sutters Fort (near present day Sacramento) where he saw David D. Colton who was ill and down on his luck at the time. He left him a sack of gold dust. Many years later, after having prospered and becoming the Vice President of Southern Pacific Railroad, David D. Colton came to Colton, California from San Francisco to attend a golden spike ceremony, to celebrate the connection in the town of Colton of Southern Pacific tracks laid west of Spandra (now Pomona) and east from Ft. Yuma, Arizona. Upon seeing Edwin Colton in the assembled crowd, David D. Colton dramatically announced, this town shall be called Colton in honor of the man who saved my life. This caused quite a stir among Coltons leading residents, who had long believed the town had been named after David D. Colton. There arose a debate among those who had lived lifetimes in Colton if there had ever been a golden spike ceremony. All that could be remembered was when General Colton had presented the city with $4,000 to build the first substantial schoolhouse, the implications were made that the donation would never have been made if indeed David Colton had not been the town's namesake. Even this was somewhat inaccurate as the $4,000 donation was made, but it was made by Mrs. Colton in the memory of her husband who had died in 1878. Yet, there is an element of truth in Mrs. Pierson's story about a golden spike ceremony. In 1876, David Douty Colton did indeed drive a golden spike celebrating the connection of two southern Pacific rail lines, but it was at Newhall, connecting north/south lines, not in Colton. And so, who is Colton's true namesake? Although an official document affirming the town site was, in fact, named after David Douty Colton has never come to light, we do have evidence provided by early Colton residents that he is the town's namesake. In 1878, Scipio Craig, then editor of the Colton Semi-Topic, reported that he was shocked to hear of the death of Gen. D. D. Colton for whom our town was named, and a committee of Colton residents drafted a resolution tendering our profound sympathy to the widow and stricken family of David Colton for whom this town was named. Now we have another controversy that casts doubts because good timely and accurate record keeping had been neglected. The passing of time dims most memories of us humans. This points out what anyone who has done much genealogy research already knows: you need to prove your sources with a high degree of accuracy! The Huntington Hotel occupies the site of the original home of General David Douty Colton. The original house was destroyed in 1906 as a result of the San Francisco earthquake. The building is constructed in gothic style, beginning in 1926. Construction was not completed until 1964.